When DH decided to turn part of the coal barn into a workshop, it had to be cleared out first. It was loaded with the previous owner's junk, plus a little of our own. As he toted stuff out, he found an old suitcase. In it, was a pile of old cotton flour and sugar sacks. We were pretty busy at the time so the suitcase was set aside and forgotten. Somehow we got to talking about that the other day, and he pulled it out so I could take a look. Most of the sacks were worn, torn, and stained. Many had been cut open to use for other things. All were cotton. A few still had their original stamped labels, faded, but legible nonetheless. 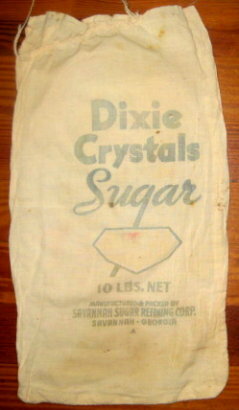 Many of them were sugar sacks, like this ten pound Dixie Crystals sack. According to an article on Wikipedia, the original Dixie Crystals sugar refinery was built in 1916-1917 in Port Wentworth, Georgia. The refinery was sold in 1997 to Imperial Sugar, which continues to sell the Dixie Crystals brand today. 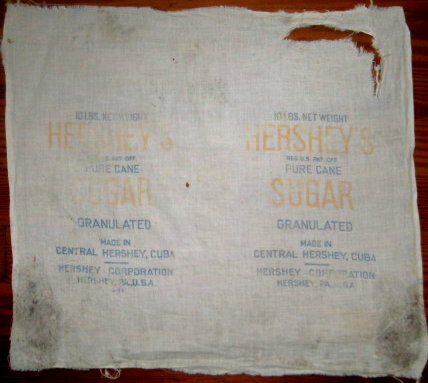 This ten pound sack once contained Hershey's granulated sugar. Hershey's of course, is the famous chocolate maker located in Hershey, Pennsylvania, though they no longer sell sugar. There were several of these larger 100 pound sugar sacks. Notice where it was made, Central Hershey, Cuba. This gives a clue as to how old the sacks might be. 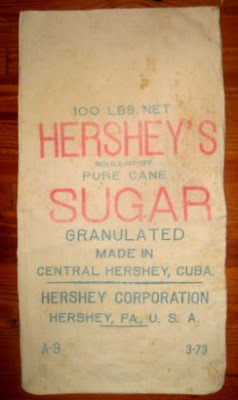 According to this website, the Hershey Company built Central Hershey, a sugar mill and mill town, in Cuba in 1916. This was at the time of World War I, when sugar was being rationed. Milton Hershey wanted to ensure a supply of sugar for his chocolate manufacturing, and what better way than to produce it himself. He sold the sugar mill in 1946, to the Cuban Atlantic Sugar Company. Also in the suitcase was at least one flour sack. I couldn't find much information about Sunkist Flour on the internet, other than two tidbits. First, an excerpt from "Reports of cases determined in the Appellate Courts of Illinois, Volume 186", which referred to a legal case in 1910. 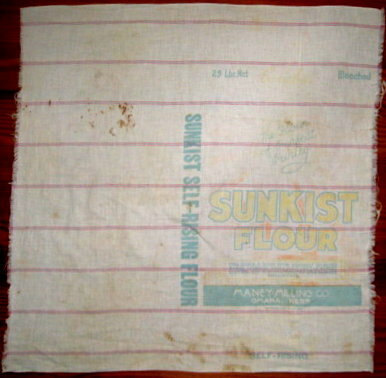 Sunkist flour was evidently milled by the Maney Milling Company in Omaha, Nebraska. The plaintiff had an order for 4,000 barrels of flour (at $5 per barrel), of which only 155 were delivered before the mill burnt down. The other tidbit was on the website of the Douglas County Historical Society of Omaha as a list of miscellany. It mentions a Sunkist Flour ink blotter, circa 1940. Notice that it is self-rising flour. I didn't know this, but self-rising flour was invented in 1845 in Bristol, England. 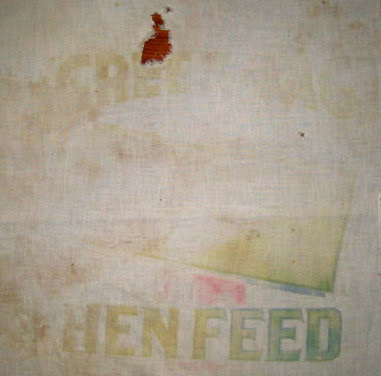 This one is partially too faded to read, but as you can see, it is hen feed. Of course, we already knew that previous occupants of our house had chickens. I reckon today we would call this layer ration. It appears to be stamped "Green (something or other) Hen Feed." I can't make out that "something or other" so I have no way to research it. Still, it was an interesting find. Most of the other sacks have been washed so many times that the inks are completely faded. Though worn and stained, the cotton fabric is usable, for sacks or for something else. Nothing is anywhere near "mint" condition, so not of much value. Still, these are little glimpses into the history of our old house. historically interesting about your house? What a treasure to have found! I've not been lucky enough to find similar things in my house, but the owners of it found all kinds of historical documents relating to old censuses of the area when they cleared the attic. What a fun find! 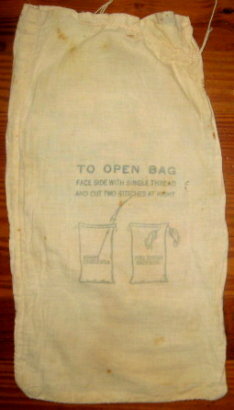 I *think* that last one may be a "Green Tag Hen Feed" sack from the Mountain City Mill Co, Chattanooga, TN- but I've been unable to find a pic online to confirm. 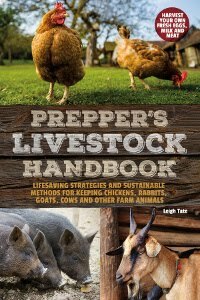 There are books of vintage feed/etc sacks, or your local historical society may be able to help, if you are so inclined. I love discovering old things like your bags. If you need extra money just put the Hershey bag on eBay. It's amazing how many people collect Hershey related things especially in Pennsylvania. and my house isn't old enough to have anything historical in it, it was built in 1996. But in each house (except for the brand new one) we have found something left by the previous owner. In TX we found some carnival glass. I don't know if it was true carnival glass or a remake...and I have no idea where it is at right now, but I'm sure it's hear somewhere. In this house we found a box of china tea cups with saucers. I went through it and some were broken or chipped but most are in good condition. I should see if I can figure out what they're worth...someday when I get some time. it's great to go back in times through a find like this! and yes, we found loads of stuff in our cottage, mainly due to the fact that the old lady, who owned it, died in here - and her family (in uk) left most of the stuff as it was. we found her old glasses, an old perfume bottle, newspaper clippings as insulation in the doorframe and loads of old photos, which nobody wanted. we still have most things here, we only gave some brass brewery gadgets to a local museum. oh yes, and we found the branding iron that belonged to her long dead husband! We are only the third people to live in our house, which was built in 1928. In our loft we found a teachest with an assortment of part and full rolls of wallpaper. Better still there is some fantastic carpet up there. One day I'll go up there with a camera. Our house was only 8 months old when we moved in so nothing historically interesting at my house. How wonderful to have found those sacs though. I know your children are grown but what a great history lesson! Theresa, all thanks to the internet! Geodyne, that would have been a real treasure. Hopefully they passed those on to a local genealogy library. I did find a book on personal family history when we first moved in. I donated it tot he genealogy department of our county library. Maggie, thanks for that lead! A Tennessee origin would make sense. Maybe someday I can confirm that. Renee, still, that's part of the home's history! Bettina, I would have enjoyed going through all that. Good idea to give some to the local museum. Mary, that's useful stuff! The wall papers would have been fun. We found a remnant of the horrid pink wall to wall carpeting. It was enough to cover a spot in our bedroom where the flooring was rough and splintery. 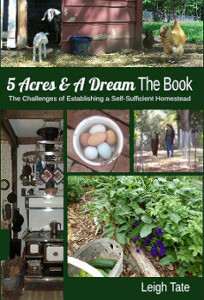 Interesting finds....a combo of food and textiles....two of my favorite subjects! You know what's weird? In my whole life, we've always been the first owner of our houses. The two houses I grew up in and the two houses I've owned as an adult. I guess we'll have to leave historical items behind for the next owners! Great post! I love to find tidbits of history like this! Isn't it cool to know about the past? Oh, that is so cool! I collect flour, feed and sugar sacks, and, in fact, the cloth I put on my lap while spinning is a feed sack from my husband's family's mill from way back when. You have there a wonderful glimpse into history. Are you foing to have any of the framed or made into something? What an interesting find!! Have you looked under the building? Your research is revealing about the history of flour and sugar! Thanks! We found an old wagon road on our place. Trees have grown in it but it is still there and we live near the end of the Oregon Trail. Our land was left untouched for over 40years. The cotton sacks are a real treasure. Thank you for posting the photos. I loved seeing and reading about them. Our house is too new to have any historical finds but, I found an old indian rock grinding mortor and pestle in a pile of rock that was on the property. They were used to grind acorns to flour consistency. That was neat. NEATO!!! Lee wanted to find cool things when we got our house. Unfortunately, all we got was current trash and nothing old. Sue, you have great interests, LOL. You should leave little time capsules in the various houses you live in. That would be fun for someone in the future. Benita, that is so neat! We've thought about having ours framed, just not sure where they'd hang, except the kitchen. I'll have to think about that as I work through my kitchen remodel. Flower, yes! Dan found an old scrub board under the house. Along with a lot of trash. Callie, that's a great find! Robin, we had a lot of that too. Mostly that in fact. I would like to let the chickens out in the rain but we always let Morgan out with the chickens so she can try and protect them. Morgan gets too wet and muddy in the rain, so when it rains Morgan and the chickens stay in. Callie, yes, that makes sense. It seems not all chickens are interested in going out in the rain anyway. Glad you have some sun!